If a 'company town' or 'university town' can have a governing board of elected representatives, or even that everyone employed there gets a vote or a say on decisions, then that could be a great model to start with and still allow some return on investment if required. Some checks & balances so that people preserve dignity & some freedoms. Then again, from what I can tell, Elon Musk isn't in this for profit - he's a visionary who needs to make profit in order to accomplish his real goals. John: The University of Central Florida Board of Trustees is a public corporation. The UCF Board of Trustees is composed of people appointed by the Florida Board of Governors (an agency of the State of Florida). I do not know whether UCF-BOT is a for-profit or a not-for-profit corporation. However, UCF-BOT probably is permitted to earn profits on its assets, and the profits might include royalties on patents that are based on research and discoveries at UCF research colleges. UCF-BOT might contract with a space transportation company to take people and supplies to a spaceport on Mars. The transportation company would have to make a profit on such services in order to remain in business. UCF is a space-grant university. Florida Space Grant Consortium is a NASA sponsored program administered by the University of Central Florida. UCF might establish a College of Sociocultural Systems Engineering. Students of the college could participate in the design, construction, testing and operation of such systems. UCF could sell completed systems (Martian settlements) to groups of setters. After arriving on Mars, a group of settlers could move into their new settlement and then sign an agreement like the Mayflower Compact. They could thereby establish a government for their settlement. I'm sure a lot of scientists would like a university model. However, university doesn't have the billions necessary for Mars. And university has focus on science, not building. So I argue for the company town model. I'm sure a lot of scientists would like a university model. However, university doesn't have the billions necessary for Mars. UCF is a public university. The United States Congress could give 10 billion dollars to UCF so that UCF can pay for the design and construction of a prototype Martian settlement on Earth and the construction of a prototype Martian settlement on Mars. And once that first successful prototype settlement has been built on Mars the planetwide settlement of Mars will be possible. And the UCF Foundation Inc. can help to fund UCF research projects. The Foundation is a tax-exempt public charity that can accept tax-deductible contributions. Is Canada going to claim Mars and then give Mars to the corporation that you have been advocating? If Canada is not going to do that then I think that your proposal cannot be a model for "Mapping a way forward". Canada is a signatory of the UN Outer Space Treaty. So Canada can't do that any more than the United States can. Not unless it formally withdraws from the Outer Space Treaty. I would like to say my corporation will establish the first human settlement on Mars, and I will declare myself king of Mars! Or president for life! With the proviso that my successor must be democratically elected by the citizens of Mars. But I'm not a billionaire like Elon Musk, I'm just some schmuck who can't afford to go to the annual Mars Society Convention. A head hunter (agent of a personnel agency) has submitted me for a job locally in Winnipeg, and at the same pay rate I got in Miami in 1999/2000! In Miami I was paid in US dollars, this one is in Canadian dollars, so it's that much less. But I can live in my own house, and only one country to pay taxes to, so would be absolutely wonderful! Pray for me. Part of my bias against universities comes from my alma-mater. I went to the University of Manitoba. In the early 1980s, it was the only university in my province to offer computer science. The Maclean's list didn't exist at that time, but does now. It ranks universities. Every accredited university in Canada and the US is on that list. Except universities that have asked to be removed. It ranks universities according to the quality of education a student will receive at that university. It doesn't include community colleges or career colleges or junior colleges, it doesn't include non-accredited universities; only fully accredited full universities. And a university may have excellent research, but that's ignored. The list only counts quality of education a student will receive. And a university may specialize in one subject, but that's ignored too. The list evaluates universities overall for everything offered at that university. As you can imagine, Ivy League universities rank near the top. My alma-mater ranks absolute dead last, bottom of the list, worst university in Canada or the US. The University of Manitoba is a provincial university; Americans would equate it to a state university. But it's the worst of them. When I was in high school, the representative from the University of Manitoba tried to claim they're one of the best universities in all of Canada, and tried to compete with the University of Waterloo for computer science. That university is recognized as the best computer science university in the world. But the University of Manitoba? Um, no! We now have the Maclean's list, which clearly shows how bad the University of Manitoba really is. The University of Manitoba now has a "Smart Park". This is a section of land the university owns, part of the land of their main campus, but previously undeveloped. The "Smart Park" is a series of buildings with space they rent to commercial business. If a business wants a prestigious address that they can associate with the university, they can pay a premium price for office space in one of these buildings. The university administration has become obsessed with this, and the revenue they gain from it, rather than students. They have focused on this commercial real estate at the expense of students. And I've seen the inside of these buildings, they aren't even the best office space. They're equivalent to old warehouse buildings downtown that have been converted to office space. Ironic considering the "Smart Park" was built in an open field. For a couple decades the university is obsessed with profit from the "Smart Park" at the expense of education for students. Corporations by their very nature are supposed to compete with one another, the very idea of having only one corporation defeats the purpose of incorporation. The market requires many players, not one. A corporation is not supposed to be a monopoly, that goes against the rules. As soon as you have one corporation governing the planet, someone is going to file an antitrust suit against it an try to break it up due to anticompetitive behavior! No, Tom. You are again applying your bias. You make many assumptions. First your idea of a competition is part of the American system, and all modern western capitalist economies. But that is competition between business; you are confusing business with corporation. The corporation was invented as a means to raise capital. A corporation was invented as an artificial person, the word "corpus" is Latin for body. The idea was to limit liability. That this artificial person owed investors, and the artificial person was liable for whatever it did, not individual investors. This was a major change, previously all that existed was sole proprietorship or partnership; in both cases the owners are personally liable for whatever they do. Today in practice the board of directors can be held liable for actions an debts of the corporation, although large corporations somehow appear to shield their board of directors from liability for debts. Lawyers. However, where a corporation owns the whole planet and dictates who the government officers are and what the laws shall be the corporation can declare that it is immune to judicial processes. This is known as the doctrine of sovereign immunity. Are you not familiar with a "company town"? That's a town established by one company, where the one company provides most or all services. It's a monopoly. I didn't invent it. For corporate government, I'm suggesting the corporation establish one and only one settlement. That one settlement will be a company town. That means company owned dormitory for its employees, company owned cafeteria, company owned clothing stores, company owned grocery stores. I would allow others to set up business in the company town, but expect the company to dominate that one town. This town would service the interplanetary transport, so the only Earth money needed to transport settlers to Mars will be to deliver them to Low Earth Orbit. Everything from LEO to the surface of Mars will be provided by the space economy: propellant either from Mars, one of its moons, or asteroids. Food and replacement parts from the company town on Mars, etc. That way we don't need to deliver any profitable product to Earth, instead settlers pay in Earth currency, but the transport operates on the space economy. So once established, almost all of the ticket price repays investors. That's the big trick to make this work. And that means a company town. To support that company town, the company will ensure all settlers arrive at the company town, not delivered directly to any other location. So everyone arriving on Mars must go through that company town. That gives the company town a chance to recruit employees, and to sell goods. Look, Tom. The United States had the chance to lead in space. The people of the US expected they were leaders in space, but throughout the 1950s, the American government refused to do any work or invest any money at all in space. The Soviet Union did a lot of hard work and invested a lot of money from 1951 onward, and made a lot of announcements of their successes, but the US government suppressed all news of what they did. Then in 1957 the Soviet Union launched Sputnik. They deliberately installed a radio transmitter that would transmit on a ham radio frequency, so private individuals could track it, confirm Sputnik. It worked, the US government couldn't suppress it any more. The American people responded with shock, asked how the US government could be passed. What they didn't know is he US government knew what the Soviet Union was doing, deliberately decided to do nothing themselves, and suppressed all news. The US government spread propaganda that everything Soviet was old, obsolete, decades behind the US. Obviously it wasn't. The US was ahead in some things, behind in others. The US only led in space long enough to spoil what the Soviet Union did. NASA had big plans, but Nixon drastically slashed NASA. He would have completely dismantled NASA if Congress would have let him get away with it. Skylab was only built after the Soviet Union launched Salyut 1. The US has been a spoiler, not a leader. The US government receives more tax dollars from the space industry that it spends on NASA. For the government, space is profitable. The US slashed funding of NASA so much that the European Space Agency achieved dominance in launching commercial satellites. This resulted in the US space industry falling behind; not behind the Soviet Union or Russia, but behind western Europe. Taking commercial business meant US federal tax dollars. So the US responded by investing money to develop new launch vehicles; not just one, but two. Again this obsession with competition. They didn't seem to realize they were already competing for commercial business with Europe, Russia, and China, that internal US competition was redundant. The US federal government went to the same military contractors who had gouged and screwed American taxpayers since cancellation of Apollo. Corporate executives were certainly willing to take government money, but had no intention to develop a launch vehicle that was actually affordable. This program was called "Evolved Expendable Launch Vehicle" or EELV; the two vehicles developed were Delta IV and Atlas V. Many major technological improvements, but still not competitive against Ariane for commercial satellite launch. So you ask why the US government hasn't established settlements in space. Uh huh. They've shown two things: (1) they really aren't interested, (2) they want to see profit for the US federal government. Many space fans keep talking about Mars declaring independence right away. But if that happens, how does the US government get return on investment? If they're going to invest multiple billions of dollars, then they will insist upon positive return on investment. So those Americans who ask the US government to have NASA do it, but at the same time talk about Mars independence, are actually sabotaging their own effort. Bottom line: The US isn't going to. We need some other way to establish settlement on Mars. I have pointed out development of the Airbus A380 cost $25 billion in US dollars. This wasn't any government program, this was all private investment. So sufficient private money is available, the but condition is private investment demands return on that investment. I proposed treating Mars as a giant company town. I have given an historical example: St. John's, Newfoundland. The first ever European settlement in North America after the Vikings. St. John's was successful, and started more than a century before any government colony. It still exists, it's now the capital of the Canadian province of Newfoundland. Bottom line is if the US was ever going to settle space, it would have been done decades ago. Time to move on, find someone else who will. How many astronauts has the ESA launched into space? Launching private satellites is a business, not a space program. For all the astronauts Russia has launched into space and all the space stations it has built, Russia has never left Low Earth orbit, and it hasnever successfully landed a space probe on Mars, not even after 60 years since launching Sputnik. Seems to me Russia' space program has stalled ever since it failed to land the first humans on the Moon, it made enormous efforts, but when NASA got their first, the Russians just gave up, as if nothing else was important other than getting there first. Why do you suppose that was? I think if it wanted to, Russia could have landed some people on the Moon after Apollo, but it just didn't seem interested, all it wanted to do was build space stations. There's the spectacular stuff that gets attention, then there's practical stuff that earns money. Launching communication satellites earns money. Whether you want to accept it or not, the US federal government has noticed they make more tax dollars from the space industry than they spend on NASA. And that money they spend on NASA is necessary to keep the space industry healthy, and profitable. Russia had dominance in space from 1951 until Apollo 8. America didn't realize it until Sputnik, and the public didn't like being second. Sputnik was launched by an R7 rocket, the Soviet Union's first ICBM. The message was they could drop a nuclear bomb anywhere on the planet. The public, including myself, had dreams of human space exploration, but world powers saw it as military dominance. The space race continued to demonstrate technological superiority, and to gain allies. Reality wasn't nearly as pretty as we thought at the time. Russia didn't give up when you thought they did. Russia was severely affected by losing the race to land a man on the Moon. They seriously considered trumping what NASA did by sending a crew directly to Mars. Western intelligence learned of this, so that's when NASA got serious about Mars. Russia started by sending unmanned probes to Mars. All failed. And no one had life support capable of sending crew to Mars and back. So Russia chose to put serious effort into developing that life support capability by launching space stations. But Russia didn't actually quit immediately after Apollo 11. They continued anyway. They conducted 3 tests with their LK lunar lander in Low Earth Orbit. By 1972 they were ready to go to the Moon. But the Russia government felt this was too little, too late; so they cancelled it. But you think their space program was stalled? Do you realize they launched over 240 Soyuz spacecraft have flown in space? How many Apollo spacecraft flew? How many Shuttle flights? Russia built a series of space stations, each improving on the last. The core module of Mir was an improved version of Salyut 7. And the "Russian service module" is actually the core module of ISS, which was originally built to be the core module of Mir 2. They never quit. And how many American spacecraft successfully landed on Venus? But I never suggested asking the Russians or Europe to lead settlement of Mars. I suggested private enterprise do it. America appears to be the hare to Russia's tortoise. America has been asleep since Apollo, did something with Shuttle, but fell asleep again. Almost woke up with VentureStar, but fell a sleep before taking a step. Almost woke up again with Constellation, but again fell asleep. Is sleep-walking now, but not really getting anywhere. Commercial space are the only ones making any progress now. re universities - across the globe there are probably around over 15,000 universities. Many command hundreds of millions of dollars of revenue each year. In the USA, some 22 million people are engaged in university employment, support and study. I have long argued that a University on Mars should be a priority for economic development of the planet. 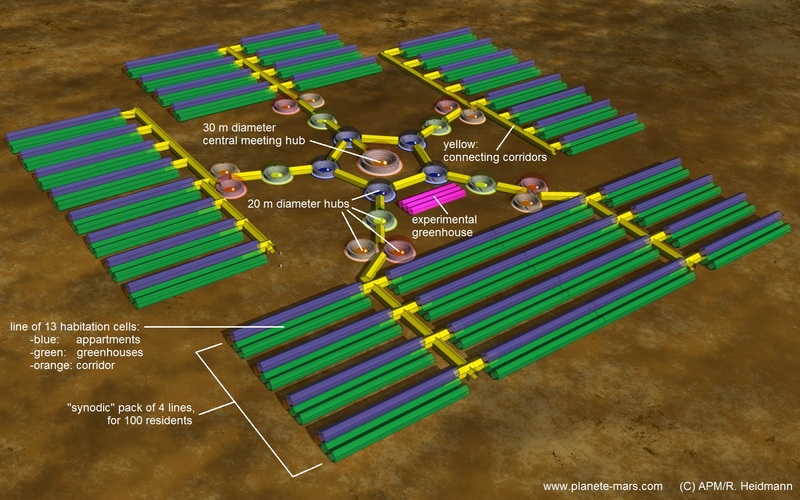 The first Mars base could well be a "university town" rather than a "company town". The research opportunities on Mars are huge. Either a consortium of universities or a single university might set up shop there, paying Space X or a Mars Consortium for transit, habitat and life support. Big donors would love to be associated with such projects. One can envisage a "Bill Gates Centre" at the Harvard University of Mars. This is a quick route to guaranteeing a cash injection of tens of millions, perhaps hundreds of millions of dollars every year. Louis: I have written about the University of Central Florida above (post #227). Another reason to think that UCF would be a good choice is that, as a public corporation, it has its own police department. The university could exert sovereign control over a branch campus on Mars. Exercising sovereign control over a spacecraft or spaceport or other sovereign facility (e.g., a prototype Martian settlement) is permitted by the Outer Space Treaty. If the university admitted students from dozens of terrestrial nations then, when the prototype settlement was eventually sold to a group of the university’s graduates, the Old World would probably accept the settlers’ declaration of sovereignty over their settlement. I think that this Mars development model is the closest that we have yet come to “mapping a way forward”. Remember this guy? It was part of the police force of New Detroit, a company town run by a defense conglomerate OCP in the Movie Robocop. If a fossil is discovered on Mars, it will be like a gold rush on Mars! But even without evidence of life once on Mars, I think academic interest in the planet will be huge once scientists and researchers realise that a trip there is within the realm of the possible. Competent police officers so not draw their weapon in anger ever their entire career. The US has far too much violence right now, why would you even think of an abomination like this? 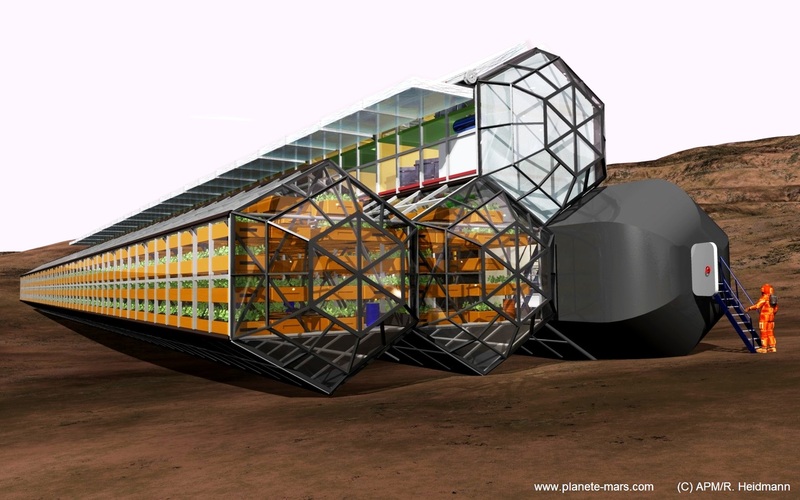 The article cited below includes images of what a Martian settlement might look like. A College of Sociocultural Systems Engineering at the University of Central Florida might design a prototype settlement that looks similar to the settlement in the images presented below. Can't say I find that French design practical or pretty. I think most habitat space will be piled over with Mars regolith. Where are the vehicles? Surely a community that size would have lots of vehicles. A community of 1000 would surely have at least 20 Rover vehicles for exploration of the surrounding area, lots of robot diggers and so on, and other technical vehicles. For a community of 1000, there might well be a central area with natural lighting, that part might be right. But people would still need to be protected from radiation. A central area would probably have stone cloisters around a central atrium, so people were protected from radiation. Personally I would also like to see us experimenting with creating pressurised spaces in gullies/canyons, where we would put in a glass or plastic roof. This space would have paths and be wooded. Additional light would be piped in from the surface, so it was as light as anywhere on Earth. We could start small and gradually work our way up to much larger canyon spaces, maybe several hundred metres long, 100 metres wide and perhaps 200 metres deep. Scott your post in 238 shows a far off future state when we have leverage mass and power into a delivery system that can teraform mars at least inside a jar.....There appears to be lots of redundancy in the hub and outward arms of the colony with the green house appearing to have a blanket for night time draping over the glass. Plant trays are stacked so tightly that the only way plants could grow is with artificial light. Why do that with a glass greenhouse? If you need artificial light, then put it underground. I've argued strenuously for ambient light. That's the only way to recycle oxygen and water without electrical power. And plants are more robust vs radiation that we are. The surface of Mars at any altitude where you would build a settlement has half the radiation of ISS, and almost no heavy ion galactic cosmic rays. I still like "Mars Homestead Project, Phase 1 - The Hillside Settlement". Yea, I'm biased because I was part of that project. But part of the idea is at least some of the greenhouses would be illuminated by ambient light, yet living spaces are under deep regolith. Our design had a 2-story atrium deep within the hill, with light pipes feeding light from the surface. Apartments would have a window at one end. The roof would be under at least 2.4m of regolith. The window would have a flat "shade" outside and above the window, providing shade from the sky. You could call it an "awning", but it would be flat and horizontal to the ground, with 2.4m of regolith piled on top as well. The purpose of the "window shade" or "awning" would be radiation shielding. The window itself would be strong glass, with mineral oil filling the space between panes. That's how a window is built to a radiation "hot cell". Mineral oil is as clear as water, but it's a hydrocarbon liquid polymer. The oil blocks light ion radiation, proton radiation, and neutron radiation better than water. Water is better for heavy ion radiation, but Mars atmosphere blocks that. With the window shade, what you have to worry about is solar radiation. That's mostly proton, and a tiny bit of neutron radiation produced as secondary radiation when solar radiation strikes the ground. So this window design protects against that. It may sound strange that I go on so much about radiation, when I've argued for no radiation shielding what so ever for the greenhouse. But for the greenhouse we want sunlight. Humans must be protected, plants not so much. Especially annuals, which are plants that only live one year. Plant a seed, grow the plant, then harvest. Next year plant again. Annuals cannot accumulate radiation damage over multiple years like humans, they just grow then are gone. Ps. I keep fantasizing about an estate on Mars. It would include a large bedroom on the top story. This special bedroom would be round, with a dome that extends from floor level. Get into this room with a stairway through the floor, nothing to pierce the dome. Not even 1 millimetre of "lip" from the floor to the dome, like windows of a Frank Lloyd Wright house, but round. The dome would actually be 2 domes of almuno-oxynitride (aka aluminum oxynitride or ALON), with mineral oil between the panes. Again, radiation protection. But with material strong enough that a descent size meteorite would just bounce off. And positioned so you get a panoramic view of the entire area, 360°. With a raised platform in the centre, with a big round bed. Would that attract some young honey? First post is about "law and governance" a pretense that once a colony reaches rebel state that we will need paper to control actions of those that are there. Sounds like ethics to me and selection of thoses that believe in its sound practice.